Sita's Simply Delicious: Risotto: the unexpected student food. So it's been a little (by little I mean long, and I apologise for that) while since my last post. Starting university again has kept me busy. And it being my third year, it has been busier than ever. However, every student knows, working hard and playing hard requires fuel, and there is only so much pesto pasta one can tolerate. Having said that I do have a brilliant recipe for the ultimate pesto pasta, a jazzed up version of that pesto out of a jar... but I'll save that for a lazy day blog! 1. Risotto is a vehicle for flavour - you can add literally whatever you like/ have hanging about your fridge. 2. Risotto is really really filling. It is fuel for economizers, that is, a little goes a long way. 3. It's a store cupboard ingredient. Buy it, keep it in the cupboard, and it will stay there, mould free, for an age. Start by sweating the shallots gently in a wide based, shallow pan. Cook until they are translucent. Then stir in the rice with the buttery shallots, ensuring each grain is coated. At this point, splash in your wine, or whichever substitute you are using. Cook on a medium heat. Once the wine is totally absorbed, add in your vegetables if they are raw. If the vegetables you are using are already cooked then do not add them yet, save them until the end, once the rice is cooked. Now pour in a ladle or two of the stock, stir in gently, but there is no need to keep stirring constantly (as most recipes instruct). Just make sure you are cooking on a medium heat. Once the stock is absorbed, add in a couple more ladles. Keep repeating this process until all the stock is absorbed, this should take about twenty minutes. If you finish all the stock but the rice is still not cooked, just add some boiling water. Once the rice is cooked, stir in your fresh herbs, cheese and a knob of butter. Check for seasoning (in this recipe it is best to season at the end, because the stock and cheese will both contribute to the salt content), just add to taste. At that's it, it is ready to serve! 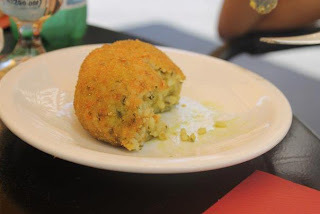 This is a dish I fell in love with on my last day in Rome this summer: Arancini, my last taste of Italy before I got on the plane back home to London. It basically a risotto ball, coated in crispy breadcrumbs. Crispy on the outside and unctuously smooth on the inside. Perfection! To make these, all you need is some leftover risotto, breadcrumbs (I just bought mine from the supermarket) and some olive oil. Simply use your hands to mould the cold risotto into balls. Roll each ball in breadcrumbs, making sure they are fully and generously coated. Heat enough olive oil in a medium to shallow frying pan, so that each arancini is about an inch deep in the oil. Make sure the oil is not too hot, you will know when the oil is ready when you drop a breadcrumb in, it will sizzle and turn golden within a minute. You are just looking for the outside of the arancini to turn golden brown and crispy, as inside the risotto is already cooked. Once, they're done, drain on kitchen paper and serve immediately, arancini are best enjoyed warm. So there you have it, risotto. The unexpected student staple.